Duke Devlin works at The Museum at Bethel Woods and shows visitors around the hallowed site. He knows it well, as he himself was a young man rocking out in the mud in ’69. Even though those attending the festival are listening to pounding bass cannons instead of wailing folk and rock music, he said it’s great to see a new generation making Woodstock memories. Especially since his generation has moved on. 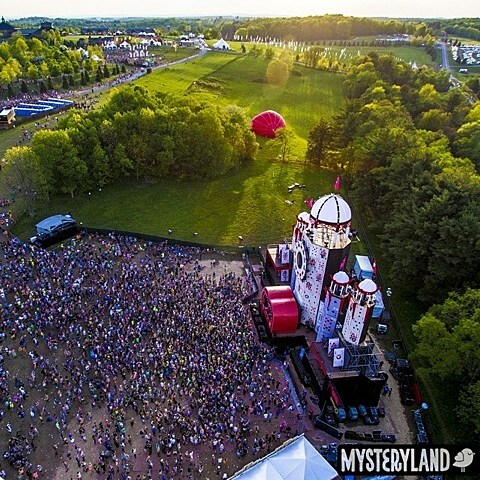 Mysteryland marketed itself as something beyond the normal electronic dance music festival, where the main and only attractions are the DJ sets. The festival’s intention: to create an immersive, sensory experience with a “peace, love, unity, respect” ethos. “We want to create a multiple day life and interactive art experience… in between the commercial dance events and the real off-site creative festivals like Burning Man,” said ID&T co-founder Irfan van Ewijk. In keeping with this vision, the idyllic festival grounds were decorated with a whimsical fantasy-like theme in sherbet hues. While half of the attraction was the music of the big name performers, attendees could just as easily have spent their time attending yoga and workshops with vegan sushi in the “Healing Garden” area or watching performers bedecked in Dia de los Muertos costumes. And fantasy-like themes there were, as you can see from the giant castle pictured above.